The U.S. Army Corps of Engineers’ Philadelphia District announced the launch of the Seven Mile Island Living Laboratory, an initiative designed to advance and improve dredging and marsh restoration techniques in coastal New Jersey through innovative research, collaboration, knowledge sharing, and practical application. The Army Corps has partnered with the State of New Jersey and the non-profit Wetlands Institute on the concept. Seven Mile Island, located in Cape May County, N.J., is backed by 6000 acres of state-owned marshland that provides both critical habitat for birds, fish, shellfish and other wildlife, and coastal resilience for barrier island communities. Marshes in this area, as well as throughout the region, are showing signs of degradation and are vulnerable to impact from rising seas. Chasten said the Living Lab will also provide information on the risks and benefits of natural and nature-based feature projects. The laboratory extends between the inlet boundaries of Seven Mile Island, and includes existing and historic dredged material placement sites, confined disposal facilities, federal and state channels including the New Jersey Intracoastal Waterway, extensive tidal marshes, a mixture of sandy and muddy sediments and, most important, a rich historic dataset to build upon. Since Hurricane Sandy, the Army Corps, the State of New Jersey, The Wetlands Institute, The Nature Conservancy and other partners jointly conducted four marsh restoration and habitat creation projects aimed at improving coastal resilience. 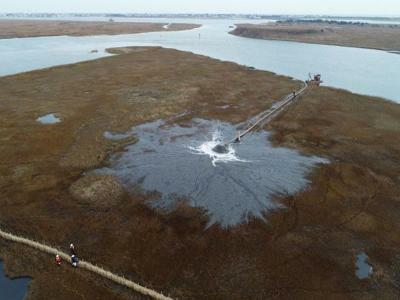 The projects involve beneficially using dredged material from the New Jersey Intracoastal Waterway to restore marsh and provide suitable habitat for wildlife on land owned and managed by the state. This is a departure from the traditional practice of dredging and placing the material in Confined Disposal Facilities cut off from coastal processes and the natural sediment system. The newly created colonial nesting bird habitat at Ring Island, for example, has been successfully utilized by black skimmers, common and least terns, and American oyster-catchers – all state endangered species or species of special concern in the state of New Jersey. The successful nesting of least terns on Ring Island marks the first time they have nested in coastal marshes since the 1980s. Project partners continue to monitor the demonstration projects, share project results, and develop “lessons learned” to apply to future projects. One focus area for the Living Lab will be to build on the success of these demonstration projects and implement future projects with a more systematic approach. The Living Laboratory will establish a forum for experts to share knowledge, provide input, and disseminate information to stakeholders. The Wetlands Institute is located near the geographic center of the Seven Mile Island Living Lab study area and provides dock facilities, research labs, and an environmental education center. The organization promotes the appreciation, understanding, and stewardship of coastal and wetland ecosystems through programs in research, conservation, and education. Now celebrating its 50th anniversary, the Wetlands Institute was founded in 1969 by Herbert Mills, then Executive Director of the World Wildlife Fund, who acquired thousands of acres of marshland for conservation purposes. Today, these are part of the Cape May Wetlands Wildlife Management Area, owned and managed by the New Jersey Division of Fish and Wildlife, and are at the heart of the Living Laboratory. Tedesco said she expects the Living Lab will function as a think tank to develop and demonstrate new techniques so that these projects can gain more widespread application. Seven Mile Island Living Lab research activities, data collection efforts and Working Group meetings will kick off in April 2019. The U.S. Army Corps of Engineers Philadelphia District provides water resources solutions for more than 9 million people across five states. One of the District’s missions is to maintain the 117-mile New Jersey Intracoastal Waterway. Dredging is necessary along the waterway to enable safe maritime navigation. When the dredged material is clean, USACE looks for opportunities to reuse the material in a beneficial and cost-effective way. This approach relies on Regional Sediment Management and Engineering With Nature principles. The New Jersey Division of Fish and Wildlife is a professional environmental agency dedicated to the protection, management and wise use of New Jersey’s fish and wildlife resources. A significant portion of the Seven Mile Island Living Lab consists of public lands owned and managed by the New Jersey Division of Fish and Wildlife and comprising a portion of the 17,200-acre Cape May Wetlands Wildlife Management Area. The Wetlands Institute is a non-profit 501(c) (3) organization promoting appreciation, understanding, and stewardship of coastal and wetland ecosystems through programs in research, conservation, and education. The Institute works to restore, preserve and protect wetlands and coastal ecosystems for a healthy environment for people and wildlife. Research and conservation efforts are focused on the issues that are affecting wetlands and the critical species that live in them.